​In 2014 Energy Transfer Partners and Dakota Access announced plans for a 1,168 mile long oil pipeline that would carry crude oil from the Bakken oil fields in North Dakota to Illinois (via South Dakota and Iowa) where it will link with another pipeline that will transport the oil to terminals and refineries along the Gulf of Mexico. The company also claims that some of the crude oil may be loaded onto rail cars for shipment to the east coast. Construction has started in several places, including along the Missouri River just upstream from the Standing Rock Sioux's drinking water supply. They have set up a resistance camp just across the river from the construction site and the tribe has also sued (represented by Earthjustice) the Army Corps of Engineers for violations under the National Historic Preservation Act and for threatening their livelihoods, sacred sites, and water. The Standing Rock Sioux have led a national campaign to draw attention to the pipeline, which crosses the Missouri River less than a mile upstream of the Tribe’s reservation, imperiling its drinking water supplied and destroying sacred sites. The tribe has launched an international campaign, called “Rezpect our Water”, asking the Army Corps to deny the key permits for the pipeline. Standing Rock ST and Supporting Legal Documents, Press Releases, Officials, etc. Here in DC we are mobilizing tribal leaders to stand with Standing Rock and other nations fighting for climate justice! Below is a photo of over 80 elected tribal leaders!" In 1958, Public Law 85-915 was passed by the U.S. Congress, compensating the Standing Rock Sioux for tribal land flooded ten years prior to form Lake Oahe. Rights to all minerals below the lake were reserved for the tribe. Because of this no corporate or government entity has a right to dig beneath the lake without permission of the tribe and is breaking the law in attempting it. The Army Corps jurisdiction is in the operation of the reservoir. Two Northern California attorneys, Larry Bragman and Ford Greene, report on a visit to the Water Protectors' protest camp, describing their finding that the Standing Rock Sioux tribe legally owns all mineral rights to the land beneath Lake Oahe. In 1958, Public Law 85-915 was passed by the U.S. Congress, compensating the Standing Rock Sioux for tribal land flooded ten years prior to form Lake Oahe. Rights to all minerals below the lake were reserved for the tribe. 1) This afternoon, US District Court Judge James Boesberg denied Dakota Access Pipeline (DAPL) attorneys’ request for a Temporary Restraining Order, which sought to block publication in the Federal Register of the Army Corps’ Notice of Intent for an Environmental Impact Statement (EIS) on the Lake Oahe crossing. 2) This morning, the Army Corps of Engineers officially published a notice of intent in the federal register to prepare a partial EIS. 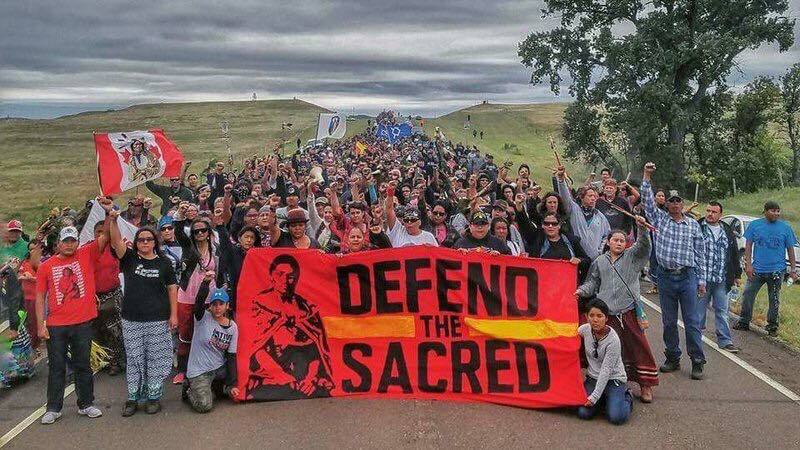 3) Also today, The US Circuit Court of Appeals dismissed the Standing Rock Sioux Tribe’s appeal of the September, 2016 US District Court decision to deny their request for a preliminary injunction that would have stopped construction of the Dakota Access Pipeline in order to protect a concentration of sacred archaeological sites. The appeal was dismissed as moot because the majority of the construction has already been completed on the sites in question. 4) The ND Supreme Court ruled today to partially grant a petition allowing non-North Dakota licensed lawyers to more easily represent the more than 600 water protectors facing criminal charges. Bits: We cannot let media divide us... We want to stress that we are cleaning the camps, not clearing them. We do not support or endorse any “raids.” We have not asked for law enforcement to assist in clearing camps and in fact have repeatedly told them there will be no forcible removal..... We have never stopped fighting the pipeline. There have never been any negotiations. .....We cannot fall into the traps of divide and conquer—that is how we lost so much before, and Standing Rock will not let that happen again. .....Together we rise......We ask our allies to be grounded in prayer in all that you do. We will prevail. On Wednesday, February 22, 2017, the Navajo Nation filed an amicus brief in the United States District Court for the District of Columbia with 34 Federally Recognized Indian Tribes against the Lake Oahe Easement for the Dakota Access Pipeline granted by the U.S. Army Corps of Engineers.The federal government is required to be held accountable in its trust responsibility to the Standing Rock Sioux Tribe. ​Cheyenne River attorney Nicole Ducheneaux on Friday appealed the ruling to the U.S. Court of Appeals for the District of Columbia Circuit. She also asked Boasberg to "prevent the flow of oil through the Dakota Access pipeline" until the appeal is resolved. this Court prevent the flow of oil through the Dakota Access Pipeline, which would result in the ultimate harm to Tribal members’ free exercise of religion. In the alternative, if the Court is not inclined to grant an injunction pending appeal, the Tribe seeks an injunction until the D.C. Circuit rules on the emergency motion for an injunction pending appeal that the Tribe will file, if needed." "The company has almost completed reaming the hole—i.e., making it larger, in order to accept the pipe and is taking final passes this week that will occur just before the pipe is pulled through the hole. The company anticipates pulling the pipe through this week and then commencing final testing. Dakota Access will file its next status report on March 20, 2017." 3/14/17 - DAPL RESPONSE "The free exercise of religion is indisputably important to the functioning of a free society. Like all important rights, however, it should not be held back only for use as part of a last-gasp litigation tactic. For the reasons stated above and in the earlier briefing, the motion for a stay pending appeal should be denied, and the Court should reject the alternative request for an injunction until the D.C. Circuit rules on a yet-to-be-filed motion in that Court"
3/14/17 - ORDER denying 165 Motion for an Injunction Pending Appeal. Signed by Judge James E. Boasberg on 3/14/2017. you see what they're doing? they're willing to sacrifice themselves for Trump. sure, bring more suits against us, but leave Trump out of it. they know that is where we have our best chance to fully win. Trump had NOLEGAL RIGHT to push through DAPL and now KXL. "On Mar. 21, Sara Juanita Jumping Eagle and other members of theStanding Rock Sioux Tribe, the Cheyenne River Sioux Tribe and others asked to be allowed to intervene in the two tribes’ suit challenging the pipeline in order to file a complaint naming Dakota Access LLC, the Corps and Trump, alleging that the president illegally directed the federal government to approve the pipeline for business reasons. If the group is allowed to intervene, the court should only do so on the condition that Trump be let out of the case, the Corps said." because we are NOT the terrorists. judge mostly rejects DAPL request to shield information on the safety of the pipeline, citing possible use by terrorists.